How do I fix my blocked sink? If your sink is blocked, you should call a qualified plumber immediately. They can assist you in clearing your sink. We own, manage and have the responsibility of the sewerage network outside of your property boundary, and therefore cannot assist with faults within your home or business. Find out more about your responsibilities. What should I do about a blockage in my pipes? Please do not attempt to clear the blockage yourself. If you live in Brisbane or Ipswich, we can clear the blockage for you. Please call 13 23 64 (24/7) or complete a blockage removal request (fees may apply, please see below). Alternatively, call a licensed plumber to remove the blockage. If you need a referral to a licensed plumber, phone the Master Plumbers' Association of Queensland on 07 3273 0800 (8am-5pm weekdays). Should you contact Queensland Urban Utilities to investigate the blockage and it is found to be on your private infrastructure, fees may apply. Fee includes call out fee and one hour of work on site. $32 including GST will be charged for each additional 15 minutes over the first hour. $82 including GST will be charged for each additional 15 minutes over the first hour. We do not provide this service for properties in the Lockyer Valley, Somerset and Scenic Rim areas. Please contact a licensed plumber for assistance. What if the blockage is in Queensland Urban Utilities network? If your plumber has inspected your sewer pipe and identified that the blockage is in our infrastructure, please call us on 13 23 64 (24/7). Alternatively, your plumber may choose to call us directly and request for one of our officers to attend and inspect the site. If the location of the blockage is within the sewer network outside of your property line, then the response crew will investigate and resolve the problem. Can I be compensated for plumbing fees paid to clear a blockage? If the blockage occurred in a part of the sewer network that you are responsible for, you'll need to pay the plumbing costs. If it occurred on our side of the network, we may provide assistance. If you engage a plumber, you will need to pay the plumbing fees, including any blockage investigation fees regardless of whether the failure is in your pipes or our part of the network. Copy of the paid plumber's invoice or account (if available). What happens if I need an urgent clean up at my property? If the inside of your home has been impacted by a sewage overflow, please lodge a claim with your insurer. They will organise the urgent clean up and restoration of your property and will liaise with us about your insurance claim. 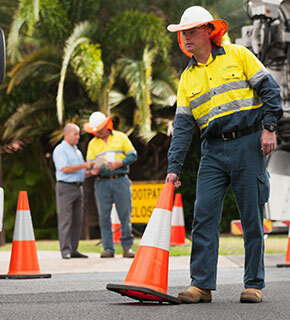 If the incident is caused by a problem with our network, we'll assist with the clean up of the area around your home. We follow a clean up procedure established under guidance from Queensland Health, which includes removing any solid material, and rinsing and disinfecting the affected area to kill off bacteria and smell associated with sewage. As an additional precaution, we advise people to stay away from impacted areas for 48 hours to allow sunshine to kill off any remaining bacteria. We will also conduct an evaluation of our pipes to determine the cause of the incident and possible steps to minimise future issues. Read more about steps you can take if your property is damaged. An overflow relief gully (ORG) is a drain-like fitting in the ground outside the home, usually near the laundry area. ORGs are designed to overflow sewage outside your house if there’s a blockage in the plumbing or excess rainwater in the sewerage network. When an ORG is not functioning correctly, the property damage and health risks associated with sewer flooding inside or under a property are greatly increased. If a sewer pipe becomes blocked, or stormwater pipes overflow and flood the sewerage network during wet weather, the ORG fitting should pop off to release the pressure and direct the sewage away from your home. It is the property owner’s responsibility to make sure the ORG is properly fitted and maintained. A non-compliant ORG may impact on insurance claims for damages resulting from a sewer spill. Find out more about ORG maintenance and operation. How can I prevent blockages and overflows? Putting the wrong things down sinks, pipes and toilets can lead to blockages, overflows and expensive plumbing bills. Slow-draining sinks, toilets or showers should be investigated by a licensed plumber before they cause a total blockage or lead to a sewage overflow inside your property. Overflows sometimes occur due to improper stormwater connections from down pipes or water tanks draining into sewer pipes on private properties. Please ensure your stormwater pipes are not connected to the sewerage network or overflow relief gully. An overflow relief gully (ORG) is a grated outlet located in the ground outside your home, usually near the laundry. It's designed to act as a release valve in the event of a blockage or if there's excess rainwater in the sewerage network. Homeowners are responsible for maintaining the ORG along with all other plumbing and drainage within the property boundary. Make sure stormwater in your yard drains away and does not build up and flood your ORG. Make sure your ORG sits at least 75mm above ground level to avoid collecting stormwater during heavy rain. It should also sit at least 150mm lower than the lowest internal household drain to prevent overflows inside the house. Check your ORG is clear and not covered by landscaping, garden beds, pot plants or other items. Ensure the surrounding area slopes away from the building to direct potential overflows away from your home. Regularly check that the metal or plastic grill covering the ORG is loosely fitted and can pop off to allow an overflow to occur, rather than overflowing inside the house. Find out more about overflow relief gullies.